Napoli eye Aston Villa captain Ron Vlaar Serie A side Napoli have entered the race to sign Aston Villa Dutch centre-back Ron Vlaar, according to Il Corriere dello Sport. Serie A side Napoli have entered the race to sign Aston Villa Dutch centre-back Ron Vlaar, according to Il Corriere dello Sport. The Italian side are targeting a left-back and a striker as their top choice for January but reports have linked their centre-back Raul Albiol to Tottenham Hotspurs which mean a centre-back will be needed in case of his departure. Aston Villa will sell Vlaar in January as his contract expire at the end of the season and the defender has no plans to extend the deal. Vlaar will be available for a cheap price. Manchester United, Southampton and Arsenal have also been in link with him for the past few weeks and now the Italian side have also joined the Premier League outfits for the Dutch centre-back. According to Daily Express, Arsenal boss Arsene Wenger is planning to seal a deal for £8million. 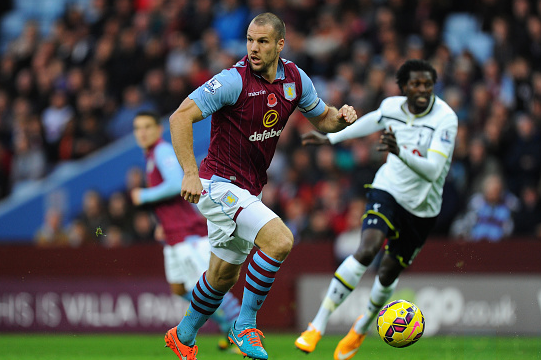 Aston Villa are keen to keep him atleast till the summer but Vlaar is eager to join a Champions League side. The 29-year-old who was the part of Netherlands squad in the World Cup joined the Villains from Feyenoord in 2012. He has played 63 Premier League games since his move. Currently, he is spending his third season and has made 7 appearances.